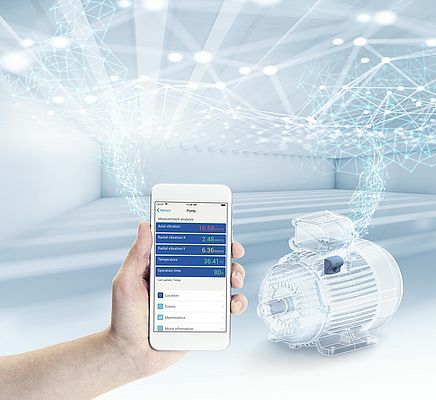 WEG has unveiled its brand-new Motor Scan product targeted to deliver remote monitoring of WEG Motors to maximize uptime and enable predictive maintenance. This new technology allows maintenance professionals to make informed decisions about the health of installed motors and react accordingly depending on the data captured. The WEG Motor Scan system uses Industry 4.0’s digital technology, including Industrial Internet of Things (IIoT) and Big Data Analytics to give clients a competitive edge in this dynamic and challenging business environment. Available for frame sizes from 100 to 450, WEG’s sensor measures the vibration and temperature of motors to detect anomalies. Easily retrofitted via a mounting clamp, the sensor tracks vibration, surface temperature as well as running hours, and will provide data on speed, start/stop time, load and efficiency via Bluetooth. For ease of use the captured data is stored in the cloud and the user can use an App, available for both iOS and Android devices, on their smartphone or tablet to access it. Users can also access the data on laptops and desktops via a dedicated web portal. Powerful analytics help to process the data and predict pending failures or hidden problems based on frequency spectrum analysis. Warning levels are pre-set based on acceptable baselines of temperature/ vibration and software is able to plot performance curves with the captured data. Essentially, WEG Motor Scan takes the monotony out of manually collecting and monitoring data, removes the guesswork of preventive maintenance and eliminates the inefficiency of reactive maintenance. Also, by training maintenance professionals to take on the specialised requirements of predictive maintenance, it provides the opportunity for companies to upskill staff and expand their capability.